The underachievement of gifted students: What do we know and where do we go? This article by Sally Reis and D. Betsy McCoach reviews years of studies on underachievement among the gifted. It explores some of the problems of identifying these students. The authors also include suggestions for those interested in pursuing potentially promising new lines of research and inquiry in this area. Reis, S. & McCoach, D.
The process of defining underachievement, identifying underachieving gifted students, and explaining the reasons for this underachievement continues to stir controversy among practitioners, researchers, and clinicians. Despite this interest, the underachievement of gifted students remains an enigma. This article reviews and analyzes three decades of research on the underachievement of gifted students in an attempt to clarify the present state of research. The problem inherent in defining and identifying underachieving gifted students are given special attention. The authors also include suggestions for those interested in pursuing potentially promising new lines of research and inquiry in this area. How can educators help bright students who are underachieving in school? Underachievers are a very heterogeneous group. Like gifted students in general., they exhibit great variability and diversity in their behaviors, interests, and abilities. Because students underachieve for so many different reasons, no one intervention strategy can possibly reverse these behaviors in all underachieving gifted students. We need to individualize programs for underachieving gifted students at least as much as we individualize programs for achieving gifted students. The most successful programs to reverse underachievement behaviors will provide a menu of intervention options for different types of underachieving gifted students. These menus should include curricular modification and differentiation options such as curriculum compacting, counseling components, and self-regulation training activities. Educators must also realize that home, peer, and cultural environments may impact students' levels of achievement. As educators, we may or may not be able to change the external factors that contribute to the underachievement of certain gifted students. However, students who have reversed their underachievement behaviors have noted that having a teacher who supported and believed in them helped them overcome their underachievement. Therefore, in the absence of developing formal programs for underachievers, providing underachievers with support, attention, and positive feedback could help these students reverse their underachievement. The underachievement of gifted students is a perplexing phenomenon. Too often, for no apparent reason, students who show great academic promise fail to perform at a level commensurate with their previously documented abilities, frustrating both parents and teachers (Whitmore, 1986). The process of defining underachievement, identifying underachieving gifted students, and explaining the reasons for this underachievement continues to stir controversy among practitioners, researchers, and clinicians. Legitimate problems exist in determining whether these students are at greater risk for social or emotional problems than other students, and most interventions to reverse underachievement have met with limited success. Practitioners who responded to a National Research Center on the Gifted and Talented needs assessment identified underachievement as a major research problem (Renzulli, Reid, & Gubbins, 1992). Despite this interest, the underachievement of gifted students remains an enigma. Any discussion of issues relating to underachievement in gifted students must carefully define both the constructs of giftedness and underachievement. Defining underachievement in gifted students seems as if it should be an easy and straightforward task. Unfortunately, no universally agreed upon definition of underachievement currently exists. 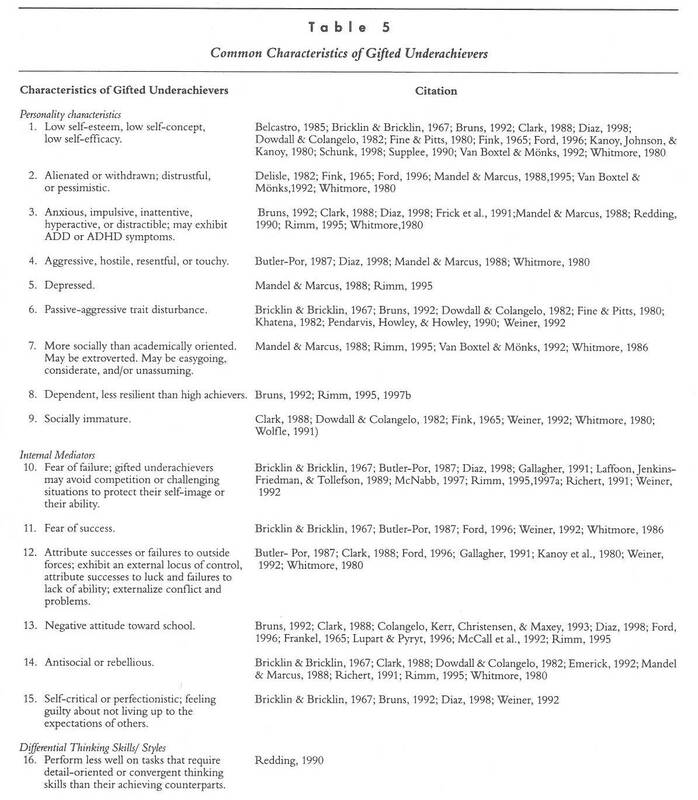 Several recent researchers' operational and conceptual definitions of gifted underachievement are summarized in Table 1, Table 2, Table 3, and Table 4 (please see all Table links at bottom of article). 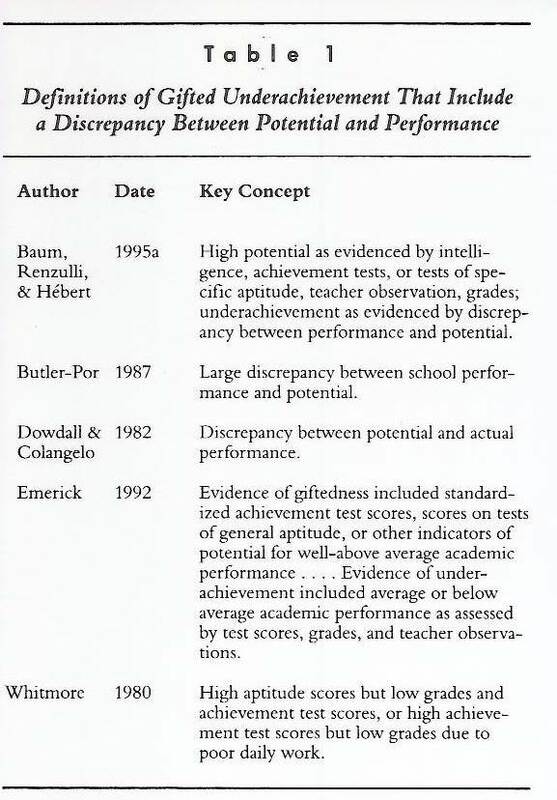 The most common component of the various definitions of underachievement in gifted students involves identifying a discrepancy between ability and achievement (Baum, Renzulli, & Hebert, 1995a; Butler-Por, 1987; Dowdall & Colangelo, 1982; Emerick, 1992; Redding, 1990; Rimm, 1997a; Supplee, 1990; Whitmore, 1980; Wolfle, 1991). 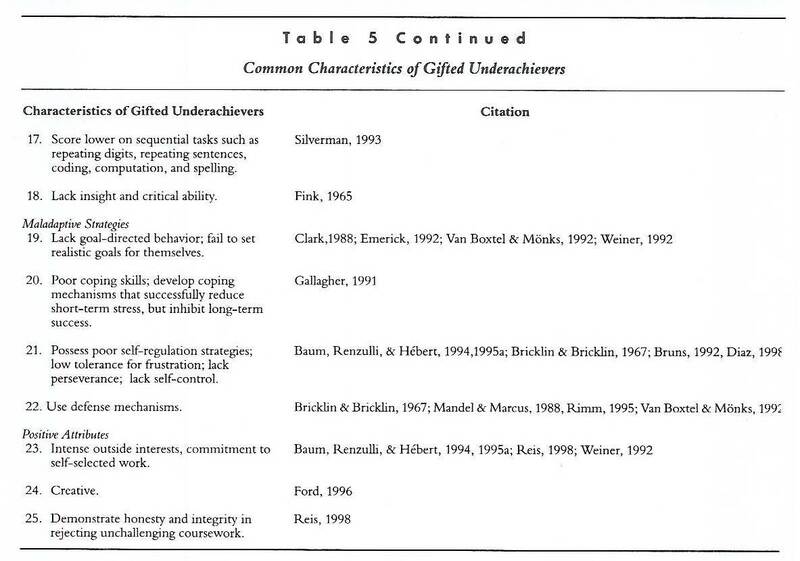 Three general themes emerge from the many operational and conceptual definitions of gifted underachievement (Dowdall & Colangelo, 1982; Ford, 1996). The first theme, displayed in Table 1, portrays underachievement as a discrepancy between potential (or ability) and performance (or achievement). A second, smaller number of authors define underachievement as a discrepancy between predicted achievement and actual achievement. This genus of this definition, illustrated in Table 2, views underachievement as a regression equation involving human potential and performance (Frick et al., 1991). If a student performs more poorly on measures of achievement than one would expect based on measures of ability, then he or she is underachieving. The third theme, presented in Table 3, views underachievement as a failure to develop or utilize latent potential without reference to other external criteria. Researchers proposing definitions in this category make no attempt to explicitly define or measure potential. In this conception of underachievement, underachievers may be viewed as individuals who fail to self-actualize. 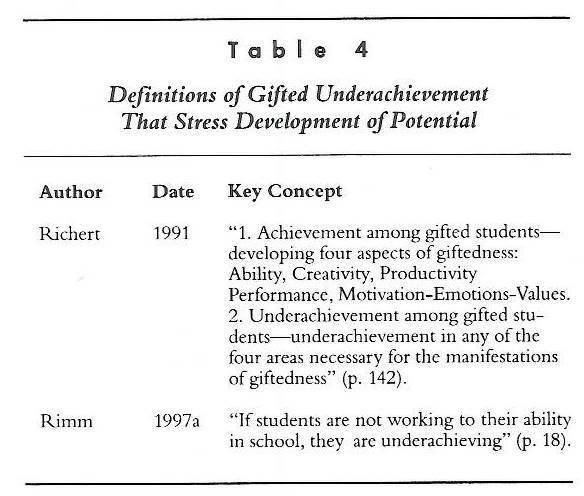 Definitions of gifted underachievement as a discrepancy between potential and performance are by far the most common. However, if one accepts the general premise that underachievement involves a discrepancy between ability and achievement, a need exists to operationally define these key concepts. A common method of defining ability involves the use of an IQ test, such as the WISC-III or the Stanford-Binet IV. However, the criteria needed to identify giftedness vary from state to state and from district to district. In some states, students must achieve an IQ score at or above a certain cut-off in order to acquire the gifted label. Many states mandate the use of multiple criteria to determine giftedness. Because different school systems use different criteria to label a student gifted, the populations of students who are identified as gifted vary; and, in some cases, they are not comparable. This phenomenon is sometimes called "geographic giftedness" (Borland, 1989). Defining achievement is even more problematic. Two common measures of achievement are standardized achievement test scores (e.g., the California Achievement Tests, the Iowa Test of Basic Skills, the Stanford Achievement Tests, Metropolitan Achievement Tests, the Terra Nova, etc.) and classroom performance as evidenced by course grades. Standardized achievement tests offer one advantage over classroom grades: They provide documented, empirical evidence of reliability. However, because standardized achievement tests do not directly reflect the actual school experience, they may not be indicative of a student's classroom performance. Classroom grades, though unreliable and teacher dependent, provide one of the most commonly used methods to assess and evaluate students. Almost all colleges and universities use high school grades in their admissions procedures. Students who are required to repeat grade levels or courses are rarely singled out as a result of low standardized achievement test scores. Rather, they are retained as a result of their classroom performance. Distinguishing exactly what constitutes a discrepancy between ability and achievement also poses challenges. If a student scores in the 99th percentile on an IQ test, that does not mean that he or she should also score in the 99th percentile on standardized measures of achievement. No reason exists to believe that all gifted students should achieve well academically (Janos & Robinson, 1985) or that ability and achievement should be perfectly correlated (Thorndike, 1963). Pirozzo (1982) asserted that, generally, about half of the gifted children who score in the top 5% of intellectual ability on individualized IQ tests do not demonstrate comparable school achievement. Thorndike's four reasons that explain why the correlation between measured intelligence and measured achievement is less than perfect provide insight into current issues regarding Underachievement. No test is 100% reliable. Differences in scores will arise as a result of sampling errors, student mood and health on the testing days, and other extraneous variances. Confidence intervals are usually reported with the standardized test scores. For example, an observed score of 130 on WISC-III is in the 98th percentile. The 90% confidence interval for a score of 130 is 124-134. In other words, if a student were to take the same IQ test again, there is a 90% probability that his or her score would fall between 124 and 134. A score of 124 would place the student in the 95th percentile, while a score of 134 would place the student in the 99th percentile. In other words, one can stipulate with 95% confidence that this student's IQ places him or her in the top 5% of the population on this measure. Conversely, there is a 10% chance that this student's "real" IQ score is lower than 124 or higher than 134. Because of these errors of measurement, psychologists can never determine with 100% certainty a student's "true" score on the original measure. Using the estimation of the first true score to predict a student's expected score on another related measure compounds these measurement uncertainties. For example, statistical regression to the mean further complicates the comparison of two aptitude or achievement measurements. When a person scores at one extreme of the testing continuum on one testing occasion, he or she is more likely to score closer to the mean on the next testing occasion. Therefore, operational definitions of underachievement as a discrepancy will overidentify underachievement in students with higher ability levels and underidentify students with lower ability levels (Frick et al., 1991). Thorndike (1963) cautioned educators and psychologists not to waste their time and effort attempting to provide explanations arising solely from measurement errors, discussed below. "Criterion heterogeneity is the extent to which a criterion score of either aptitude or achievement changes its nature and meaning from one person to another" (Raph, Goldberg, & Passow, 1966, pp. 11-12). If the criterion is academic achievement defined in terms of course grades, it is impossible to compare grades across subject areas or even across students because of the variability in content and presentation. It is erroneous to equate an A in third grade math with an A in advanced placement calculus. In fact, even comparing grades in the same course becomes impossible because of the differences in different teachers' curricular emphases, grading policies, and testing procedures. The use of standardized achievement test scores also results in a certain amount of heterogeneity in the criterion variable. Part of this variability is explained by the error of measurement of the criterion. Just as IQ scores are not completely reliable, standardized achievement test scores are also subject to errors of measurement due to content sampling, time sampling, and other issues. Furthermore, the correspondence between school districts' adopted curricula and the content of the standardized tests used to assess student achievement is usually imperfect. Two methods can help reduce heterogeneity of the criterion variable (Raph et al., 1966). The first method involves using a large random sample of subjects in order to dilute the effects of criterion heterogeneity. The second approach is to use a sample of subjects that is "homogeneous with respect to the variables thought to be significant determinants of criterion scores" (Raph et al., p. 12). Neither approach seems logical or practical for school-based research. The estimated correlation between IQ scores and estimated GPA is approximately .5 (Neisser et al., 1996). This moderate correlation between the intelligence test scores and school grades means that IQ scores explain only 25% of the variance between school grades and IQ scores, leaving 75% of the variance in achievement test scores unaccounted for by IQ scores. More recent studies (e.g., Anderson & Keith, 1997) report correlations as high as .67 between measures of ability and achievement. However, even if the correlation between ability tests and grades is as high as .70, this still only explains 49% of the variance between the two measures, leaving slightly more than half of the variance in grades unexplained by ability. Obviously, factors other than ability, such as motivation, personality characteristics, family environment, school environment, and peer pressure, influence achievement. Conceivably, the combination of these factors may account for more variance in achievement than ability alone. Environmental influences and events have a major impact on students' achievement. Consider an extreme example: No one would be surprised if a student who had been ill for a long period of time scored significantly lower on a standardized achievement test or a final exam than a healthy classmate of similar ability. However, other intervening environmental influences and experiences that may not be obvious to school personnel or parents also affect achievement. For example, a student who is clinically depressed or has other emotional or drug-related problems may experience a sudden decline in school grades. Being aware of these factors could change teacher and parent perceptions of the student as an underachiever. Moreover, a student's family, school, or community environment or peer influences may also influence his or her level of achievement. If a certain amount of variation between aptitude measures and achievement measures is normal, how does one distinguish between normal variability in scores and a discrepancy that indicates a cause for concern? As previously mentioned, most definitions of underachievement involve a discrepancy between ability and academic achievement/performance. Some of the definitions included in Table 1 through Table 4 (e.g., Mather & Udall, 1985; Redding, 1990) are specific operational definitions. Other definitions (Butler-Por, 1987; Ford, 1996; Rimm, 1997a) are broader and more inclusive. Defining underachievement operationally provides researchers and readers with a clearer picture of the composition of the sample being studied and enables the comparison of results of different studies. However, although operational definitions provide clarity, they sacrifice flexibility and inclusiveness in a quest for precision. Operational definitions categorize a continuous variable (academic performance), thereby creating arbitrary divisions between achievement and underachievement at a certain cut-off point. Ford advocated using a more holistic approach to defining and identifying gifted underachievers: "Broad, inclusive definitions of underachievement support the notion that underachievement is a multidimensional construct that cannot be assessed with unidimensional instruments" (Ford, p. 54). Defining underachievement based strictly upon scholastic success or failure may also be limiting. If a student spends much of his or her free time reading about world religions or volunteering at the local hospital, but fails to complete mundane homework assignments, does that represent underachievement or a personal decision reflecting a wise use of time? This student may have consciously decided not to expend the time or effort to do seemingly meaningless homework and willfully chose to engage in more self-actualizing activities. Schweitzgebel (1965) alluded to this phenomenon when he observed that "underachievers, in contrast to slower learners, may in fact learn rapidly and well, but what they learn may not coincide with the content of our examinations" (p. 486). The manifestation of underachievement may reflect a mismatch between the student and the curriculum. Recently, Reis (1998) suggested that gifted students who are not challenged in school may actually demonstrate integrity and courage when they choose not to do required work that is below their intellectual level. Labeling this phenomenon "dropping out with dignity," she concluded that some students may underachieve as a direct result of an inappropriate and unmotivating curriculum. Recent research (Reis, Hebert, Diaz, Maxfield, & Ratley, 1995), provides further evidence that boredom may contribute to underachievement. The results of the four-year longitudinal study with gifted high school students who either achieved or underachieved in high school suggested that boredom with the regular curriculum in elementary and middle school often contributes to underachievement in high school. When teachers expect students to complete work involving content and concepts mastered several years earlier, high-ability students become difficult to motivate. Students who are difficult to motivate are often categorized as underachievers. Whitmore (1986) suggested that "the problem of gifted students who lack motivation to participate in school or to strive to excel academically is, in most cases, a product of a mismatch between the child's motivational characteristics and the opportunities provided in the classroom" (p. 67). Finally, several fundamental philosophical issues surround the entire concept of underachievement. Who should make the decision as to what is considered achievement and, by extension, what is worth achieving? Labeling a student an underachiever requires making a value judgment about the worthiness of certain accomplishments. A teacher may believe that reading Huckleberry Finn is more worthwhile than mastering a new video game, but a child may not. This behavior illustrates a values conflict between adult and child (Whitmore, 1986). At what age should an individual gain control over his or her own destiny and make decisions regarding his or her priorities and goals? Finally, should adults place higher expectations on gifted students, or does this represent an elitist and utilitarian view of humanity? Certain responses to these questions may lead to the conclusion that underachievement does not exist or is not a problem that adults should remedy. The remainder of this article assumes that underachievement exists and merits attention and research; however, the authors recognize that even this most fundamental concept evokes value judgments and debates. Definitions of gifted underachievement are inconsistent and sometimes incompatible. Vocabulary facilitates communication; without a common vocabulary, professionals cannot assume that they are discussing the same construct. Clarifying the myriad definitions of underachievement that exist in our field will enable professionals and scholars to communicate and investigate this phenomenon more effectively. Since the identification of gifted underachievers depends on defining both underachievement and giftedness, discussing criteria for identification is no less complicated. One fact seems certain: The identification procedure should flow directly and logically from the definition of gifted underachievement. However, identifying underachieving gifted students by locating discrepancies between ability and achievement as measured by standardized achievement tests may lead to the underidentification of this population. In addition, bright students who receive poor grades may demonstrate mastery in standardized achievement testing situations (Colangelo, Kerr, Christensen, & Maxey, 1993; Lupart & Pyryt, 1996). Therefore, any system of defining, identifying, and eventually reversing underachievement should include students whose classroom performance falls significantly below their standardized test performance. Identifying an underachiever using one of the broader, more inclusive definitions is also problematic. Rimm (1997a) believes that "if students are not working to their ability, they are underachieving" (p. 18). This definition could include most gifted students, as many receive top grades in school without expending sustained effort. One could even argue that Rimm's definition includes almost all students. However conceptually sound this notion may be, a definition that does not differentiate between a straight-A student and a student who is in jeopardy of failing may have little practical utility for the practitioner. In other words, using an overly narrow definition may increase Type II error, leading to a failure to identify a truly underachieving gifted student. Conversely, using a very broad definition may promote Type I error, causing overidentification of underachieving students. Criteria for identifying gifted underachievers should include a method for determining observable discrepancies between ability and achievement. In addition, many professionals add a temporal dimension to the identification procedure (Mandel & Marcus, 1995). Often, students may not be classified as underachievers unless they have exhibited low performance for at least a year. Students may experience short-term lags in achievement that may not be indicative of a long-term underachievement problem. However, whenever a student's performance drops substantially over a short time period, it should merit the attention of a teacher or a counselor. Some professionals may try to gauge an age/performance discrepancy when identifying underachievers (Mandel & Marcus, 1995). In other words, they may not identify a student as an underachiever unless performance in at least one major subject area is at least one year below grade level. Although this may be a suitable method for identifying underachievers from the general school population, such an age/performance discrepancy may only identify the most severely underachieving gifted students. One would expect a gifted student's performance to be above grade level in some subject areas, especially those areas in which that student has been identified as gifted. When a gifted student is performing only at grade level in those content areas, there may be a justifiable cause for concern. Using such an identification method to identify gifted underachievers may lead to problems of underidentification. Rimm, Cornale, Manos, and Behrend (1989) suggested using longitudinal test data in order to screen for possible underachievement. Such a method may provide more insight into the nature of the child's achievement since children are repeatedly compared to the same norm group. IQ test scores, achievement percentile scores, or grades that have declined for three years in a row are strong indicators of an underachievement problem. However, using such a formula to screen for gifted underachievement may underestimate the number of students who are falling into patterns of underachievement. Often, standardized tests have low ceilings, and when gifted students score at the ceiling of a testing instrument, it is impossible to know how much higher the student's performance might have been if the ceiling had been raised. Therefore, even though a gifted student's performance may decline over time, he or she could still appear to be at the top of the norm group. In other words, "tests may not register the decline since the first test did not discriminate accurately" (Rimm et al., 1989 p. 62). We propose an imperfect, yet workable operational definition for defining and identifying underachievers in general, as well as gifted underachievers. Underachievers are students who exhibit a severe discrepancy between expected achievement (as measured by standardized achievement test scores or cognitive or intellectual ability assessments) and actual achievement (as measured by class grades and teacher evaluations). To be classified as an underachiever, the discrepancy between expected and actual achievement must not be the direct result of a diagnosed learning disability and must persist over an extended period of time. Gifted underachievers are underachievers who exhibit superior scores on measures of expected achievement (i.e., standardized achievement test scores or cognitive or intellectual ability assessments). Ideally, the researcher would standardize both the predictor and the criterion variables and would identify as underachievers those students whose actual achievement is at least one standard deviation below their expected achievement level. In reality, the standardization of classroom grades may be neither feasible nor meaningful. Attempting to define overarching psychological constructs to describe gifted underachievers is virtually impossible. Underachievers are a diverse population, and lists or descriptions of their traits that may be hypothesized and/or researched--"common personality traits" abound. 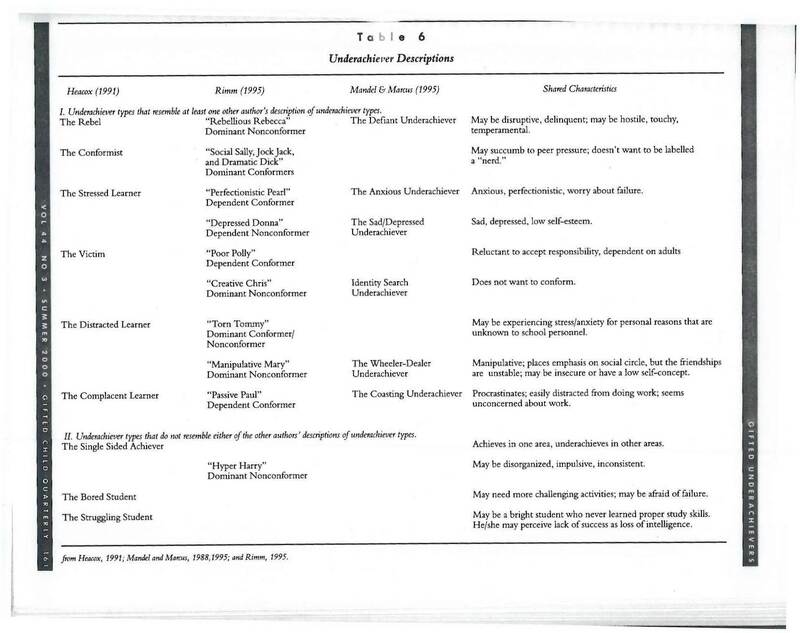 The range of characteristics ascribed to gifted underachievers by numerous authors are summarized in Table 5 and Table 5 (continued). Synthesizing the hypothesized characteristics of gifted underachievers becomes a nearly impossible task, and legitimate questions exist regarding the utility of such a list. For each personality trait common to gifted underachievers, there are many other underachieving gifted students who do not exhibit that trait. In addition, students who are not underachievers may exhibit one or several of these characteristics. Often, the lists of common personality traits contradict one another. Even the research on common characteristics in underachieving gifted students is often inconsistent. For example, low self-concept is one of the most common characteristics ascribed to underachieving gifted students (Belcastro, 1985; Bricklin & Bricklin, 1967; Bruns, 1992; Clark, 1988; Diaz, 1998; Fine & Pitts, 1980; Fink, 1965; Ford, 1996; Kanoy, Johnson, & Kanoy, 1980; Schunk, 1998; Supplee, 1990; Van Boxtel & Monks, 1992; Whitmore, 1980). Even so, several studies have found that underachievers do not exhibit lower self-concepts than their achieving counterparts (e.g. Holland, 1998). After reviewing the research in the field of gifted underachievement, Emerick (1992) observed that "the picture of the underachiever which emerges is complex and often contradictory and inconclusive" (p. 140). Interestingly, some recent research suggests that underachieving gifted students share more common characteristics with underachievers in general than they do with achieving gifted students (Dowdall & Colangelo, 1982; McCall, Evahn, & Kratzer, 1992). Several authors (Heacox, 1991; Mandel & Marcus, 1988, 1995; Rimm, 1995; Schneider, 1998) have created profiles for different types of underachievers. Three of these paradigms are compared and contrasted in Table 6. Although considerable overlap exists among the three authors' conceptions of underachievement typologies, each author has described at least one underachiever type that is not mentioned by either of the other authors. In fact, only three types--the "anxious underachiever," the "rebellious underachiever," and the "complacent/coasting underachiever"--have approximate parallels in all three authors' schema. Although these profiles may provide educators with convenient categories for various underachievers whom they encounter, they also illustrate the difficulty in trying to create a coherent profile of a "typical" underachiever. Furthermore, Rimm (1995) developed her underachiever profiles to reflect the variety of students she had treated in her clinical practice. However, underachievers who receive formal, clinical counseling do not necessarily represent the entire population of underachievers. Finally, the differences among the three authors' typical categories of underachievers further illustrate the fact that none of the lists are definitive or immutable. Research on the family characteristics of underachieving gifted students suggests that certain types of home environments may be related to the development of students' underachievement patterns (Baker, Bridger, & Evans, 1998; Brown, Mounts, Lamborn, & Steinberg, 1993; Rimm & Lowe, 1988; Zilli, 1971). Families with underachieving children tend to exhibit less positive affect (Mandel & Marcus, 1988). Whereas parental emphasis on achievement tends to inspire higher academic achievement (Brown et al., 1993), parents of underachievers may exhibit disinterested attitudes towards education (Jeon & Feldhusen, 1993). Rimm (1995) emphasized the importance of parenting styles and parental influence on the development of children's achievement and underachievement behaviors and found that inconsistent parenting techniques appeared to occur more frequently in the homes of underachieving children (Rimm & Lowe, 1988). She found that parents frequently oppose each other when disciplining their children. "In 95% of the families, one parent played the role of the parent that challenges and disciplines, and the other took the role of the protector. There was an increasing opposition between parents as the challenger became more authoritarian and the rescuer became increasingly protective" (p. 355). Rimm and Lowe concluded that particular styles of parenting appear to be less important than maintaining consistency within a parenting approach. Parents of high-achieving students seem to utilize an authoritative parenting style more often than parents of low-achieving students (Taylor, 1994). Parents of underachievers often tend to be overly lenient or overly strict (Pendarvis, Howley, & Howley, 1990; Weiner, 1992). By contrast, families of underachieving students may tend to be more restrictive and punishment-oriented (Clark, 1983). In addition, bestowing adult status on a child at too young an age may contribute to the development of underachievement (Fine & Pitts, 1980; Rimm & Lowe, 1988). High-achieving parents often provide positive role-modeling of achievement-oriented behavior; (Rimm & Lowe; Zilli, 1971). In contrast, although the parents of underachieving gifted children may verbally espouse the values of achievement, they may have lives characterized by frustration and lack of fulfillment (Rimm & Lowe). In addition, families of high-achieving students seem to encourage self-motivation, environmental engagement, and autonomy more than families of low-achieving students (Taylor). Underachieving students may not want to identify with their parents (Clark, 1983; Weiner, 1992). Fine and Pitts speculated that more family conflicts occur in underachievers' homes, and recent research (Reis, Hebert, Diaz, Maxfield, & Ratley, 1995) has supported this view. In their recent study of gifted urban underachievers, the family dysfunction that characterized the lives of the gifted underachievers contrasted with the happier home lives of the gifted achievers (Reis et al., 1995). It is impossible to establish a causal relationship from case study reports of family conflict and underachievement. Do students underachieve because they come from families in conflict? Does the underachievement of the child create problems in the family unit? Or, is there a dynamic interaction between the underachiever and the family? In another study comparing the families of underachievers to those of achievers, "families with underachieving gifted students were not classified as dysfunctional any more frequently than families with achieving gifted students" (Green, Fine, & Tollefson, 1988, p. 271). However, dysfunctional families with achieving gifted students reported greater satisfaction with their family lives than did dysfunctional families of underachieving students. Perhaps the family discord is a result of rather than a cause of, the child's underachievement. Peer issues may also contribute to the achievement and underachievement of adolescents. Peer relationships impact adolescent behavior (Brown, 1982; Clasen & Brown, 1985; Reis, Hebert, Diaz, Maxfield, and Ratley (1995) found that high-achieving peers had a positive influence on gifted students who began to underachieve in high school. Positive peer interaction contributed to some students' reversal of underachievement. Likewise, negative peer attitudes can often account for underachievement (Clasen & Clasen, 1995; Weiner, 1992). Underachieving students frequently report peer influence as the strongest force impeding their achievement (Clasen & Clasen, 1995). "Sixty-six percent of the students named peer pressure or attitude of the other kids, including friends, as the primary force against getting good grades" (pp. 68-69). An examination of the NELS: 88 data revealed that students with friends who cared about learning demonstrated better educational outcomes than those with less educationally interested or involved friends (Chen, 1997). A more recent study of peer influence on students' adjustment to school (Berndt, 1999) measured students' grades and behavior in the fall and spring of one academic year. Berndt found that students seemed to resemble more closely their friends at the end of the school year than they did at the beginning of the school year. Students' grades decreased between fall and spring if their friends had lower grades in the fall. This finding does not imply causality, since "students often select friends whose characteristics are already similar to theirs" (Berndt, p. 18). However, these findings support the notion that there is a correlation between a student's achievement and the achievement of his or her closest peer group. The construct of underachievement in gifted students differs across cultures. Unfortunately, little research has focused specifically on culturally diverse underachievers (Ford, 1996; Reis, Hebert, Diaz, Maxfield, & Ratley, 1995). Culturally diverse students face unique barriers to their achievement for several reasons. Minority students are often underrepresented in programs for the gifted and talented (Ford, 1996; Tomlinson, Callahan, & Leili, 1997). Culturally diverse students continue to face unintentional bias at school and in society at large (Ford, 1996). The definition of achievement in a particular subculture may be very different from that of the dominant culture. Several issues pose potential problems for understanding the underachievement of African American students. First, psychometric definitions tend to ignore important behavioral causes and correlates of underachievement (Ford, 1996). Second, the psychometric or standardized tests that are used to screen for gifted underachievement may not be valid or reliable indices of the abilities of students from diverse cultural backgrounds. Research suggests that using IQ scores as the sole criterion for inclusion in gifted programs can create a bias against African American students (Baldwin, 1987; Ford; Frasier & Passow, 1994). Current identification practices that underidentify gifted African American students hinder the identification of gifted underachievers of African American descent. If tests provide invalid inferences about a student's ability or achievement, they must, by extension, be invalid indices of underachievement (Ford). Finally, African American students often exhibit an attitude-achievement paradox; they report positive attitudes toward education, yet they manifest poor academic achievement. This attitude-achievement paradox makes understanding and reversing their underachievement difficult to those unfamiliar with the phenomenon (Mickelson, 1990). A longitudinal study of 35 culturally diverse, gifted urban high school students compared successful students to a similar group of high-ability students who did not achieve (Reis et al., 1995). The researchers found no relationship between poverty and achievement, between parental divorce and achievement, or between family size and achievement. High-achieving students acknowledged the importance of being grouped together in honors and advanced classes for academically talented students. Successful students received support and encouragement from each other and from supportive adults, including teachers, guidance counselors, coaches, and mentors. Students who achieved in school participated in multiple extracurricular activities, both after school and during the summer. Most high-achieving females in this study chose not to date so they could concentrate their energies on their studies. In contrast, students who underachieved had developed neither a strong belief in self nor the resilience to overcome negative experiences with their families, their schools, and their communities. In addition, Diaz (1998) found that the absence of early appropriate academic experiences impeded Puerto Rican students' opportunities to develop their abilities when they reached high school. Although her model of underachievement stresses the interaction of family, personal, community, and school factors on the behaviors manifestations of underachievement in Puerto Rican youth, it could prove helpful in understanding the nonachievement behaviors in a wider range of ethnically diverse students. Finally, educators must consider the different value systems within the Hispanic American community in order to understand the achievement of Hispanic American youth (Reis et al., 1995). Due to the difficulty in defining underachievement, it appears that the concept of underachievement maybe regarded as a subjective, rather than an objective, classification. In a culture that generally prizes both childhood and adult achievement, we label as underachievers those students who do not perform as well as we might expect them to perform. This raises several important issues. Let us define underachievement as a discrepancy between expected achievement and actual achievement. If we hold low expectations for students who then achieve at low levels, they are not underachievers. In other words, if we predict that students will not succeed, and then they fail, they have not performed below our initial expectations. The problem in this case lies in our initial predictions, not in the students' levels of achievement. When we hold low expectations for students, we may be unable to recognize, and therefore reverse, these students' underachievement behaviors. The issues surrounding the identification of culturally diverse gifted students have received greater attention in recent years, and several points seem clear. First, we must recognize the talents in culturally diverse youth. Only after we recognize potential can we assess whether performance is below potential. Students whose gifts and subsequent underachievement go unrecognized are sometimes called "hidden underachievers" (Ford, 1996) who underachieve because educational systems do not recognize their potential. Cultural relativism also becomes a factor when identifying underachievement in diverse groups. What is prized in one culture may not be valued in another, and it is difficult to impose one belief system on a culture that may define achievement and underachievement differently. Do we help or hurt a child when we ask him or her to assimilate into the majority culture? How many researchers have explored how success can be achieved in the mainstream in the United States without assimilation? Equality of educational opportunity also affects underachievement. Unfortunately, what is viewed as achievement in a poor school may be viewed as underachievement by a more competitive school or by society at large. Students who are not given adequate opportunities to develop their talents often become "involuntary underachievers." Recent research suggests that quality of schooling (Anderson & Keith, 1997; Baker, Bridger, & Evans, 1998) and completion of academic course-work research (Anderson & Keith) appear to be significant predictors of achievement for at-risk high school students. In fact, "it appears each additional academic course that an at-risk student completes can be expected to result in an increase of one eighth of a standard deviation in academic achievement test scores" (Anderson & Keith p. 264). Researchers and educators may need to adjust their views of both giftedness and underachievement when attempting to identify and address the phenomenon within a culturally diverse student population. In addition, a discussion of the cultural connotations of the construct of underachievement deserves further attention. Recently, researchers have begun to probe the relationships among underachievement, attention deficit disorders, and learning disabilities (Hinshaw, 1992a, 1992b). Students who seem unmotivated may have attention deficits (Busch & Nuttall, 1995) or hidden learning disabilities. Recent research indicates that many twice-exceptional students underachieve in school. However, "the current conceptualization and the literature on the underachieving gifted and on special populations (such as gifted/LD, gifted/ADD or ADHD, gifted students with physical disabilities or behavioral or emotional problems) appear to treat the two groupings as separate and unrelated" (Lupart & Pyryt, 1996, pp. 39-40). High-ability students can have learning problems (Barton & Starnes, 1988; Baum, Owen, & Dixon, 1991; Bireley, 1995) or attention deficits (Baum, Olenchak, & Owen, 1998) of various types that affect or cause underachievement. Distinguishing between a chronic underachiever and a gifted student who has processing deficits, learning disabilities, or attention deficits is crucial because the interventions that are appropriate for these subgroups may be radically different. The causes and correlates of gifted underachievement have received considerable attention in recent research literature (Dowdall & Colangelo, 1982; Van Boxtel & Monks, 1992; Whitmore, 1986). However, research on effective intervention models for this population remains scarce. Although conducting case studies and qualitative research on underachieving gifted students has become quite popular, few researchers have attempted to utilize true quasi-experimental designs to study the efficacy of various interventions. Most of the interventions reported in the literature (i.e., Supplee, 1990; Whitmore, 1980) were designed to effect immediate results with a group of acutely underachieving gifted students. Ethically, it may be difficult to have a true comparison group in such studies because the researcher must withhold treatment that he or she believes is valuable for underachieving gifted students. The documented effectiveness of most interventions designed to reverse underachievement in gifted students has been inconsistent and inconclusive (Emerick, 1988). Furthermore, the majority of interventions have attained limited long-term success (Dowdall & Colangelo, 1982; Emerick, 1992). Interventions aimed at reversing gifted underachievement fall into two general categories: counseling and instructional interventions (Butler-Por, 1993; Dowdall & Colangelo). Counseling interventions concentrate on changing the personal or family dynamics that contribute to a student's underachievement. Counseling interventions may include individual, group, or family counseling (Jeon, 1990). Many early attempts to improve underachievers' academic achievement through counseling treatments were unsuccessful (Baymur & Patterson, 1965; Broedel, Ohlsen, Profit, & Southard, 1965). In most counseling situations, the counselor's goal is not to force the underachiever to become a more successful student, but rather to help the student decide whether success is a desirable goal and, if so, to help reverse counterproductive habits and cognitions. Weiner (1992) outlined four different interventions for four distinct groups of low achieving students: (1) strengthening deficient reward systems, (2) alleviating cognitive and emotional handicaps, (3) filling educational gaps, and (4) modifying passive-aggressive propensities. Counselors and therapists can help underachievers strengthen deficient reward systems, modify passive-aggressive propensities, and alleviate emotional deficits; educators can help students fill educational gaps and alleviate or compensate for cognitive handicaps. Unmotivated underachievers may see no compelling reasons for becoming better students. When working with this type of underachiever, a counselor should find ways of implementing reward systems that will encourage the student's scholastic efforts and reinforce academic successes. The parents of unmotivated underachievers may also benefit from therapeutic strategies that encourage them to speak positively about education, show an interest in their child's schoolwork, and praise their child's accomplishments (Weiner). Although passive-aggressive underachievement may be more likely to indicate psychological disturbance than underachievement attributable to motivational, educational, and cognitive components, this type of underachievement seems fairly responsive to psychotherapy (Weiner, 1992). Counseling interventions for passive-aggressive underachievers are most effective when the student seeks counseling or at least participates willingly in the counseling process. Because the passive-aggressive behavior of such children is usually directed against their families, family counseling interventions may also help reverse passive-aggressive underachievement. One strategy for counseling passive-aggressive underachievers "involves helping adolescents to recognize their abilities and interests, clarify their personal value systems and preferred goals, and pursue their studies to serve their own purposes rather than to meet or frustrate the needs of others" (Weiner, p. 290). Although clinicians report success with counseling interventions, research on therapeutic approaches has documented limited success in reversing students' underachievement patterns (Baymur & Patterson, 1965; Butler-Por, 1993; Jeon, 1990). The most well-known educational interventions for gifted students have established either part-time or full-time special classrooms for gifted underachievers (e.g., Butler-Por, 1987; Fehrenbach, 1993; Supplee, 1990; Whitmore, 1980). In these classrooms, educators strive to create a favorable environment for student achievement by altering the traditional classroom organization. Usually, a smaller student/teacher ratio exists, teachers create less-conventional types of teaching and learning activities, teachers give students some choice and freedom in exercising control over their atmosphere, and students are encouraged to utilize different learning strategies. Whitmore (1980) designed and implemented a full-time elementary program for gifted underachievers. Supplee (1990) instituted a part-time program for gifted elementary underachievers. Both programs stressed the importance of addressing affective education, as well as the necessity of creating student-centered classroom environments. Both Whitmore and Supplee designed their programs to effect immediate change in student behaviors, as well as to research the construct of underachievement. Both programs provided anecdotal and some qualitative evidence of at least partial success. However, neither study used a control or comparison group; therefore, the results of their studies may not be generalizable to the entire population of underachievers. Neither study utilized a true longitudinal design, and neither researcher was able to fully track the progress of the students once they left the elementary school. Although some underachieving students appear to progress during academic interventions, the long-term effect of such programs are less clear. What happens when the student reenters the regular class and is once again faced will unstimulating schoolwork? How can the underachievement of older students be reversed? These and many other question remain unanswered. Emerick (1992) investigated the reasons that some students are able to reverse their academic underachievement without the assistance of formal interventions. Her qualitative research study examined the patterns of underachievement and subsequent achievement of 10 young adults. Several common factors appeared to play a part in the students' reversal of underachievement. Participants in Emerick's study perceive that out-of-school interests and activities, parents, development of goals associated with grades, teachers, and changes in "selves" had a positive impact on achievement. Other research also suggests that students who are more involved in extracurricular activities (Colangelo et al., 1993; Reis et al., 1995) are less likely to be underachievers. The participants in Emerick's study believed that a specific teacher had the greatest impact in reversing their underachievement behavior. In addition, participants were most likely to develop achievement-oriented behaviors when they were stimulated in class and given the opportunity to pursue topics of interest to them. These findings suggest that "reversing the underachievement pattern may mean taking a long, hard look at the underachiever's curriculum and classroom situation. The responses and actions of the students in this study suggest that when appropriate educational opportunities are present, gifted underachievers can respond positively (Emerick, p. 145). Emerick's study indicated that one type of effective intervention may be based on students' strengths and interests (Renzulli, 1977; Renzulli & Reis, 1985, 1997). In a recent study, researchers used self-selected Type III enrichment projects as a systematic intervention for underachieving gifted students. This approach (Renzulli, 1977) specifically targets student strengths and interests in order to help reverse academic underachievement (Baum, Renzulli, & Hebert, 1995b). In a qualitative study of this intervention technique, five major features of the Type III enrichment process contributed to the success of the intervention. These factors were the relationship with the teacher, the use of self-regulation strategies, the opportunity to investigate topics related to their underachievement, the opportunity to work on an area of interest in a preferred learning style, and the time to interact with an appropriate peer group. Almost all of the students who completed Type III investigations showed some positive gains in either behavior or achievement during the course of the school year. Eleven of the 17 participants showed improved achievement; 13 of the 17 students appeared to exert more effort within their classes; and 4 of the 17 students showed marked improvement in their classroom behavior. The results of this research suggest that flexible, student-centered enrichment approaches may help reverse underachievement in gifted students. Certain treatments aimed at combating underachievement combine counseling and school-centered interventions. For example, Rimm's trifocal model is a three-pronged approach that involves parents and school personnel in an effort to reverse student underachievement (Rimm, 1995; Rimm, et al., 1989). Because the factors that influence the development and manifestation of underachievement vary, no one type of intervention will be effective for the full range of underachieving gifted students. Rather, a. continuum of strategies and services may be necessary if we are to systematically address this problem. Model-based interventions provide an internal consistency between diagnostic and prescriptive elements. Therefore, future researchers in this field should posit coherent, complete models of gifted underachievement and design interventions in accordance with their proposed models. We do not know how many talented students underachieve, but we know that this issue is foremost in the minds of practitioners (Renzulli, Reid, & Gubbins, 1992). Future research must attempt to unravel the complex causes of academic underachievement and provide interventions that help reverse underachievement behavior. Several lines of research remain inadequately explored. We need to move beyond correlational studies of common characteristics of underachieving students and begin to explore linkages and flow of causality among these different characteristics and student achievement. For example, according to several authors (e.g., Belcastro, 1985; Bricklin & Bricklin, 1967; Bruns, 1992; Diaz, 1998; Dowdall & Colangelo, 1982; Fine & Pitts, 1980; Fink, 1965; Ford, 1996; Kanoy, Johnson, & Kanoy, 1980; Schunk, 1998; Supplee, 1990; Van Boxtel & Monks, 1992; Whitmore, 1980), positive self-concept appears to correlate with student achievement, raising an interesting but unanswered question: Does low self-concept cause underachievement or does underachievement result in a deterioration of self-concept, or does a third exogenous variable influence both self-concept and scholastic achievement? If low self-concept causes underachievement, interventions that raise self-concept should enhance student achievement. Therefore, one might expect counseling approaches to effectively address the problem of underachievement. However, counseling treatments have met with limited success. This direction of causation between self-concept and underachievement has not been adequately addressed. Both longitudinal studies of achievers and underachievers and the development of structural equations models of achievement and underachievement may help clarify the direction of causality between these two variables. Similar research on the flow of causality between student achievement and self-efficacy, self-regulation, student attitudes, peer attitudes, and other factors believed to influence underachievement will help researchers develop more effective intervention strategies to combat underachievement in gifted students. Another area for research involves studying whether and how gifted underachievers differ significantly from non-gifted underachievers. McCall, Evahn, and Kratzer (1992) observed that most of the comparison group research within the area of gifted underachievement equates gifted underachievers to their mental ability cohorts. Many of these studies have found qualitative differences between gifted achievers and gifted underachievers. However, an interesting, though less studied, line of research involves comparing gifted underachievers to other students who are at the same achievement level as measured by GPA, achievement test scores, and so forth, regardless of their measured mental ability. Do gifted underachievers resemble lower achieving students? Do gifted underachievers have more in common with gifted students who do achieve or low-achieving students who are not gifted? 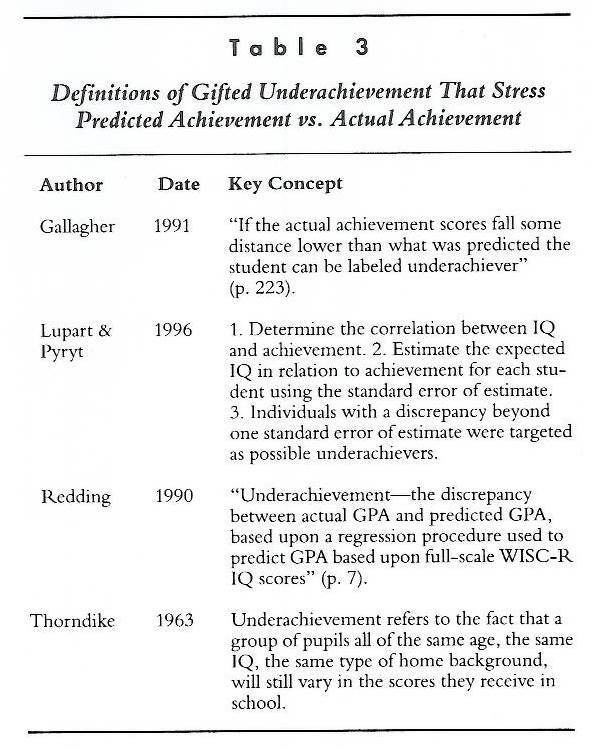 Dowdall and Colangelo (1982) observed that gifted underachievers seem to share more characteristics with underachievers than they do with gifted achievers. Future research could explore the generality of the underachievement phenomenon and investigate whether interventions that are successful with gifted students might also apply to the wider spectrum of underachieving students. Whether gifted students actually require interventions that are qualitatively different from nongifted underachievers has yet to be determined. Finally, researchers and practitioners must translate knowledge and insights about causes and correlates of underachievement into models and strategies that educators can use to develop more effective prevention and intervention programs. First, researchers should begin to explore the relationship between classroom practices and academic underachievement. If unchallenging scholastic environments produce underachieving gifted students, then providing intellectual challenge and stimulation at all grade levels should decrease underachievement. Do schools that differentiate instruction for high-ability students have fewer, incidences of underachievement? Does providing part- or full-time gifted programming reduce the occurrence of academic underachievement among the gifted? Is providing intellectual challenge especially critical during a particular age range? Bright, underachieving students might benefit from curriculum differentiation techniques (Renzulli & Smith, 1978; Reis, Burns, & Renzulli, 1992), such as curriculum compacting or Type III enrichment opportunities. These classroom strategies can provide attractive and interesting curricular replacement options and enrichment to advanced students. The literature also presents a variety of other classroom designs, such as self-contained classrooms, and home and school partnerships. Unfortunately, little research has addressed the effectiveness of these options. Most of the self-contained classroom studies lacked suitable control groups. Future research on the effectiveness of separate classes for gifted underachievers should attempt to utilize a quasi-experimental design. Family, school, and individual factors all seem to contribute to the emergence of underachievement behaviors (Baker, Bridger, & Evans, 1998). Because causes and correlates of underachievement differ, no one intervention reverses underachievement patterns in the full spectrum of gifted underachievers. Further research in this area must focus on developing multiple approaches to both preventing and reversing underachievement. Such approaches would differentiate among different types of underachievement, incorporating both proactive and preventative counseling and innovative instructional interventions. Deficits in self-control or self-regulation may engender underachievement (Borkowski & Thorpe, 1994; Krouse & Krouse, 1981). In addition, researchers should incorporate the knowledge gained from social cognitive theory to combat underachievement (Dai, Moon, & Feldhusen, 1998; Schunk, 1998 Zimmerman, 1989). Interventions that enhance self-efficacy or develop self-regulation may complement other intervention strategies and increase the effectiveness of other interventions. Different types of underachievers may require different proportions of counseling, self-regulation training, and instructional or curricular modifications. Unfortunately, the need for multiple approaches to treatment will complicate the research designs necessary to test the efficacy of underachievement interventions. Therefore, such studies will require the attention of researchers who can utilize sophisticated design techniques. The concept of underachievement, though often discussed, is still vaguely defined in the professional literature. The absence of any clear, precise definition of gifted underachievement restricts research-based comparisons and hinders the quest for suitable interventions. Although using a precise operational definition of gifted underachievement clarifies the exact nature of the population being studied, it may also prevent the identification of certain types of potential gifted underachievers. Broad, inclusive definitions of gifted underachievement allow more flexibility in the identification of gifted underachievers. However, such definitions may not adequately distinguish between gifted students who achieve and those who underachieve. The psychological characteristic ascribed to gifted underachievers vary and sometimes contradict each other. The plethora of definitions and identification methods contribute to the difficulty in studying the characteristics of this population. In general, inadequate research has examined the interventions aimed at reversing underachievement. Further research is needed in this area in order to unravel the mystery of why gifted students underachieve and how we can help them succeed. The research literature mentions only a small number of interventions. Further research and inquiry into this area should address the need for clearly defined, well-researched, and effective interventions for gifted underachievers. These interventions should probably involve counseling and some form of curriculum modification or differentiation. Future research should focus on evaluating the efficacy of both instructional and counseling treatments. As the next millennium approaches, researchers must move beyond describing this educational dilemma and instead strive to find solutions. Anderson, E. S., & Keith, T. Z. (1997). A longitudinal test of a model of academic success for at-risk high school students. The Journal of Educational Research, 90, 259-268. Baker, J. A., Bridger, R, & Evans, K. (1998). Models of underachievement among gifted preadolescents: The role of personal, family, and school factors. Gifted Child Quarterly, 42, 5-14. Baldwin, A. Y. (1987). I'm Black but look at me, I am also gifted. Gifted Child Quarterly, 31, 180-185. Barton, J. M., & Starnes, W. T. (1988). Identifying distinguishing characteristics of gifted and talented learning disabled students. Roeper Review, 12, 23-29. Baum, S. M., Owen, S. V., & Dixon, J. (1991). To be gifted and learning disabled: From identification to practical intervention strategies. Mansfield, CT: Creative Learning Press. Baum, S. M., Olenchak, F. R., & Owen, S. V. (1998). Gifted students with attention deficits: Fact and /or fiction? Or, can we see the forest for the trees? Gifted Child Quarterly, 42, 96-104. Baum, S. M., Renzulli, J. S., & Hebert, T. P. (1995a). The prism metaphor: A new paradigm for reversing underachievement (CRS95310). Storrs, CT: University of Connecticut, The National Research Center on the Gifted and Talented. Baum, S. M., Renzulli, J. S., & Hebert, T. P. (1995b). Reversing underachievement: Creative productivity as a systematic intervention. Gifted Child Quarterly, 39, 224-235. Baymur, F., & Patterson, C. H. (1965). Three methods of assisting underachieving high school students. In M. Kornrich (Ed. ), Underachievement (pp. 501-513). Springfield, IL: Charles C. Thomas. Belcastro, F. P. (1985). Use of behavior modification strategies: A review of the research. Roeper Review, 7, 184-189. Berndt, T.J. (1999). Friends influence on students' adjustment to school. Educational Psychologist, 34, 15-28. Bireley. M. (1995). Crossover children: A sourcebook for helping students who are gifted and learning disabled. Reston, VA: The Council for Exceptional Children. Borkowski, J. G., & Thorpe, P. K. (1994). Self-regulation and motivation: A life-span perspective on underachievement. In D. H. Schunk & B. J. Zimmerman (Eds. ), Self-regulation of learning and practice (pp. 45-74). Hillsdale, NJ: Lawrence Erlbaum. Bricklin B., & Bricklin, P. M. (1967). Bright child—poor grades: The psychology of underachievement. New York: Delacorte. Broedel, J., Ohlsen, M., Proff, F., & Southard, C. (1965). The effects of group counseling on gifted underachieving adolescents. In M. Kornrich (Ed. ), Underachievement (pp. 514-528). Springfield, IL: Charles C. Thomas. Brown, B. B. (1982). The extent and effects of peer pressure among high school students: A retrospective analysis. Journal of Youth and Adolescence, 11, 121-133. Brown, B. B., Mounts, N., Lamborn, S. D., & Steinberg, L. (1993). Parenting practices and peer group affiliation in adolescence. Child Development, 64, 467-482. Bruns, J. H. (1992). They can but they don't. New York: Viking Penguin. Busch, B., & Nuttall, R. L. (1995). Students who seem to be unmotivated may have attention deficits. Diagnostique, 21 (1), 43-59. Butler-Por, N. (1993). Underachieving gifted students. In K. A. Heller, F. J. Monks, & A. H. Passow (Eds.) International handbook of research and development of giftedness and talent (pp. 649-668). Oxford: Pergamon. Chen, X. (1997, June). Students' peer groups in high school: The pattern and relationship to educational outcomes. (NCES 97-055). Washington, DC: U.S. Department of Education. Clark, B. (1983). Growing up gifted (2nd ed.). Columbus, OH: Merrill. Clark, B. (1988). Growing up gifted (3rd ed.). Columbus, OH: Merrill. Clasen, D. R., & Brown, B. (1985). The multidimensionality of peer pressure in adolescence. Journal of Youth and Adolescence, 14, 451-467. Clasen, D. R, & Clasen, R. E. (1995). Underachievement of highly able students and the peer society. Gifted and Talented International, 10 (2), 67-75. Dai, D. Y, Moon, S. M., & Feldhusen, J. F. (1998). Achievement motivation and gifted students: A social cognitive perspective. Educational Psychologist, 33, 45-63. Delisle, J. (1982). Learning to underachieve. Roeper Review, 4, 16-18. Emerick, L. J. (1988). Academic underachievement among the gifted: Students' perceptions of factors that reverse the pattern. Unpublished doctoral dissertation, University of Connecticut, Storrs. Emerick, L.J. (1992). Academic underachievement among the gifted: Students' perceptions of factors that reverse the pattern. Gifted Child Quarterly, 36, 140-146. Fehrenbach, C. R. (1993). Underachieving students: Intervention programs that work. Roeper Review, 16, 88-90. Fernandez, R. M., Hirano-Nakanishi, M., & Paulsen, R. (1989). Dropping out among Hispanic youth. Social Science Research, 18, 21- 52. Fine, M. J., & Pitts, R. (1980). Intervention with underachieving gifted children: Rationale and strategies. Gifted Child Quarterly, 24, 51-55. Fink, M. B. (1965). Objectification of data used in under-achievement self-concept study. In M. Kornrich (Ed. ), Underachievement (pp. 79-86). Springfield, IL: Charles C. Thomas. Ford, D. Y. (1992). Determinants of underachievement as perceived by gifted, above average, and average Black students. Roeper Review, 14, 130-136. Ford, D. Y. (1996). Reversing underachievement among gifted Black students. New York: Teachers College Press. Frankel, E. (1965). A comparative study of achieving and underachieving boys of high intellectual ability. In M. Kornrich (Ed. ), Underachievement (pp. 87-101). Springfield, IL: Charles C. Thomas. Frasier, M. M., & Passow, A. H. (1994). Toward a new paradigm for identifying talent potential (Research Monograph 94112). Storrs, CT: University of Connecticut, The National Research Center on the Gifted and Talented. Frick, P. J., Kamphaus, R. W., Lahey, B. B., Loeber, R., Christ, M. A. G., Hart, E. L., & Tannenbaum, L. E. (1991). Academic underachievement and behavior disorders, Journal of Consulting and Clinical Psychology, 59, 189-194. Gallagher, J. J. (1991). Personal patterns of underachievement. Journal for the Education of the Gifted, 14, 221-233. Gowan, J. C. (1957). Dynamics of the underachievement of gifted students. Exceptional Children, 24, 98-101. Green, K., Fine, M. J., & Tollefson, N. (1988). Family systems characteristics and underachieving gifted males. Gifted Child Quarterly, 32, 267-272. Hinshaw, S. P. (1992a). Academic underachievement, attention deficits, and aggression: Comorbidity and implications for intervention, Journal of Consulting and Clinical Psychology, 60, 893-903. Hinshaw, S. P. (1992b). Externalizing behavior problems and academic underachievement in childhood and adolescence: Causal relationships and underlying mechanisms. Psychological Bulletin, 111 (1), 127-155. Holland, V. (1998). Underachieving boys: Problems and solutions. Support for Learning, 13, 174-178. Janos, P. M., & Robinson, N. (1985). Psychosocial development in intellectually gifted children. In F. Horowitz & M. O'Brien (Eds. ), The gifted and talented: Developmental perspectives (pp. 149-195). Washington, DC: American Psychological Association. Jeon, K. W., & Feldhusen, J. F. (1993). Teachers' and parents' perceptions of social-psychological factors of underachievement of the gifted in Korea and the United States. Gifted Education International, 9, 115-119. Kanoy, R. C., Johnson, B. W., & Kanoy, K. W. (1980). Locus of control and self-concept in achieving and underachieving bright elementary students. Psychology in the Schools, 17, 395-399. Khatena, J. (1982). Educational psychology of the gifted. New York: John Wiley and Sons. Krouse, J. H., & Krouse, H. J. (1981). Toward a multimodal theory of underachievement. Educational Psychologist, 16, 151-164. Laffoon, K. S., Jenkins-Friedman, R., & Tollefson, N. (1989). Causal attributions of underachieving gifted, achieving gifted, and nongifted students. Journal for the Education of the Gifted, 13, 4-21. Lupart, J. L., & Pyryt, M. C. (1996). "Hidden gifted" students: Underachiever prevalence and profile, Journal for the Education of the Gifted, 20, 36-53. Mandel, H. P., & Marcus, S. I. (1988). The psychology of underachievement. New York: John Wiley and Sons. Mandel, H. P., & Marcus, S. I. (1995). Could do better. New York: John Wiley and Sons. Mather, N., & Udall, A. J. (1985). The identification of gifted underachievers using the Woodcock-Johnson psychoeducational battery. Roeper Review, 8, 54-56. McNab, T. (1997). From potential to performance: Motivational issues for gifted students. In N. Colangelo & G. A. Davis (Eds. ), Handbook of gifted education (2nd ed., pp. 108-415). Boston: Allyn and Bacon. Mickelson, R. A. (1990). The attitude achievement paradox among Black adolescents. Sociology of Education, 63, 44-61. Neisser, U., Boodoo, G., Bouchard, T. J., Boykin, A. W., Brody, N., Ceci, S. J., Halpern, D. P., Loehlin, J. C., Perloff, R., Sternberg, R. J., & Urbina, S. (1996). intelligence: Knowns and unknowns. American Psychologist, 51, 77-101. Pendarvis, E. D., Howley, A. A., & Howley C. B. (1990). The abilities of gifted children. Englewood Cliffs, NJ: Prentice Hall. Pirozzo, R. (1982). Gifted underachievers. Roeper Review, 4, 18-21. Kaph, J. B., Goldberg, M. L., & Passow, A. H. (1966). Bright underachievers. New York: Teachers College Press. Kedding, R. E. (1990). Learning preferences and skill patterns among underachieving gifted adolescents. Gifted Child Quarterly, 34, 72-75. Reis, S. M. (1998). Underachievement for some—dropping out with dignity for others. Communicator, 29 (1), 1, 19-24. Reis, S. M., Burns, D. E., & Renzulli, J. S. (1992). Curriculum compacting: A guide for teachers. Mansfield, CT: Creative Learning Press. Reis, S. M., Hebert, T. P., Diaz, E. P., Maxfield, L. R., & Ratley, M. E. (1995). Case studies of talented students who achieve and underachieve in an urban high school (Research Monograph 95120). Storrs, CT: University of Connecticut, National Research Center for the Gifted and Talented. Reis, S. M., Neu, T. W., & McGuire,J. M. (1995). Talents in two places: Case studies of high ability students with learning disabilities who have achieved. (Research Monograph 95114). Storrs, CT: University of Connecticut, National Research Center for the Gifted and Talented. Renzulli, J. S., Reid, B. D., & Gubbins, E. J. (1992). Setting and agenda: Research priorities for the gifted and talented through the year 2000. Storrs, CT: University of Connecticut, The National Research Center on the Gifted and Talented. Renzulli, J. S., & Reis, S. R. (1985). The Schoolwide Enrichment Model: A comprehensive plan for educational excellence. Mansfield Center, CT: Creative Learning Press. Renzulli, J. S., & Reis, S. R. (1997). The Schoolwide Enrichment Model: A how-to guide, for educational excellence. Mansfield Center, CT: Creative Learning Press. Richert, E. S. (1991). Patterns of underachievement among gifted students. In J. H. Borland (Series Ed.) & M. Bireley & J. Genshaft (Vol. Eds. ), Understanding the gifted adolescent, (pp. 139-162). New York: Teachers College Press. Rimm, S. (1995). Why bright kids get poor grades and what you can do about it. New York: Crown Trade Paperbacks. Rimm, S. (1997a). An underachievement epidemic. Educational Leadership, 54 (7), 18-22. Rimm, S. (1997b). Underachievement syndrome: A national epidemic. In N. Colangelo & G. A. Davis (Eds. ), Handbook of Gifted Education (2nd ed., pp. 416-435). Boston: Allyn and Bacon. Rimm, S., Cornale, M., Manos, R., & Behrend, J. (1989). Guidebook for implementing the trifocal underachievement program for schools. Watertown, WI: Apple. Rimm, S., & Lowe, B. (1988). Family environments of underachieving gifted students. Gifted Child Quarterly, 32, 353-358. Rumberger, R. W., & Larson, K. A. (1998). Toward explaining differences in educational achievement among Mexican American language minority students. Sociology of Education, 71, 68-93. Schneider, S. (1998, Fall). Overcoming underachievement. (Rev. ed.). Bulletin of the Pennsylvania Association of Gifted Education, 1-7. Schunk, D. H. (1998, November). Motivation and self-regulation among gifted learners. Paper presented at the annual meeting of the National Association of Gifted Children, Louisville, KY.
Schwekzgebel, R. (1965). Underachievement: A common fallacy. In M. Kornrich (Ed. ), Underachievement (pp. 484-487). Springfield, IL: Charles C. Thomas. Silverman, L. K. (1993). Counseling families. In L. K. Silverman (Ed.). Counseling the gifted and talented. Denver, CO: Love. Supplee, P. L. (1990). Reaching the gifted underachiever. New York: Teachers College Press. Taylor, R. D. (1994). Risk and resilience: Contextual influences on the development of African American adolescents. In M. C. Wang & E. W. Gordon (Eds. ), Educational resilience in inner city America, (pp. 119-137). Hillsdale, NJ: Lawrence Erlbaum. Thorndike, R. L. (1963). The concepts of over and underachievement. New York: Teachers College Press. Tomlinson, C. A., Callahan, C. M., & Lelli, K. M. (1997). Challenging expectations: Case studies of culturally diverse young children. Gifted Child Quarterly, 41, 5-17. Van Boxtel, H. W., & Monks, F. J. (1992). General, social, and academic self-concepts of gifted adolescents. Journal of Youth and Adolescence, 21, 169-186. Weiner, I. B. (1992). Psychological disturbance in adolescence (2nd ed.). New York: John Wiley and Sons. Whitmore, J. R. (1980). Giftedness, conflict, and underachievement. Boston: Allyn and Bacon. Zilli, M. G. (1971). Reasons why the gifted adolescent underachieves and some of the implications of guidance and counseling to this problem. Gifted Child Quarterly, 15, 279-292. Zimmerman, B.J. (1989). A social cognitive view of self-regulated academic learning. Journal of Educational Psychology, 81, 329-339. Permission to reprint this article was granted by Gifted Child Quarterly, a publication of the National Association for Gifted Children (NAGC) http://www.nagc.org. This material may not be reproduced without permission from NAGC.